We are pleased to announce that Mr. Custody Coach has partnered with Our Family Wizard – a wonderful tool to better manage all child custody matters after divorce. At Mr. Custody Coach, we’re always researching ways to help to improve the toughest circumstances surrounding your divorce and custody matter. The ability to better manage your situation doesn’t end when a final divorce decree or a child custody order has been entered. As with most situations in life, there is “always room for improvement” and never has that been more true than with high-conflict, post-divorce relationships with your ex-partner. Even if you have settled into an wonderful, child-focused co-parenting arrangement with your ex-spouse or ex-partner, Our Family Wizard can improve so many areas of the co-parenting arrangement. Even if your situation has led to a parallel parenting arrangement, this program will work for you. After speaking with many people who are utilizing Our Family Wizard, we’ve concluded that we should add them to our resources page and recommend the program for use in your child custody situation. 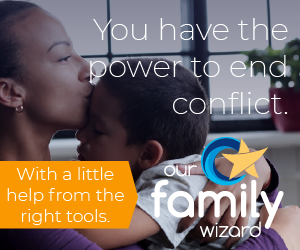 The Our Family Wizard program is filled with tools to improve the management your child custody arrangement, improve communications, create objective evidence, and more – even with high-conflict ex-spouses! The Our Family Wizard program has grown by leaps and bounds in popularity, so much so that it is now being specifically written into child custody orders in family courts throughout the country. Judges recognize that reducing and eliminating sources of conflict is essential to the children’s well-being and can help to keep families out of the court room whenever possible. This is a good thing. The Our Family Wizard program is about as comprehensive a “family life management system” as can be obtained today. For our registrants, there is even more! With your Mr. Custody Coach account, we can work with you to keep even your Our Family Wizard communications clear, concise, non-judgmental, and more for as long as you’re a member. How do you handle a ex who has a blog set up to basically bash you? He posts things that aren’t true and tweets, messages, and fb out the links to his “daddy” blogs. Also, he isn’t paying child support that is owed, owes thousands in past due medical expenses (his 1/2 of costs for kids medical bills – 5 YEARS worth!) but dines out all the time, buys Ipads and an IPhone 4 but can never seem to find the money to take care of his children? Oh…and he told our children on their last visit that “your mother never even wanted you!” when he became mad that they told him to stop talking ugly about their mom. You really are left with no choice but to take legal action, either through family courts or civil (if you have cause).